Posted November 14, 2016 by Ian McArdell & filed under Books. The enduringly popular Jago & Litefoot, Victorian gents thrown together for ‘The Talons of Weng-Chiang’, return for a twelfth box set and are once again beset by a bloodsucking menace. Perfectly mismatched by their creator Robert Holmes, Henry Gordon Jago (Christopher Benjamin) is a blustering but loveable theatre impresario, while Professor George Litefoot (Trevor Baxter) is a learned police pathologist. Together, they share both a charming camaraderie and a nose for trouble. Vampires are a subject worryingly close to home for the pair, as their previous brush left close ally Ellie Higson (director Lisa Bowerman), barmaid of the Red Tavern, bitten and cursed – albeit with the effects halted by Litefoot. However, thanks to an encounter with The Master, Ellie’s bloodlust has returned… and with it has come an enmity for her friends. With a closer knit storyline than usual, Justin Richards begins with ‘Picture This’, which concerns theft and a murder at London’s mysterious Scarlet Gallery. With one of our heroes soon imperilled, we were thrilled to find the reliable Inspector Quick (Conrad Asquith) the hero of the hour, with the resolution neatly prefiguring that of the final story. Scripting duo Paul Morris and Simon Barnard take over for ‘The Flickermen’, a creepy tale of an ailment which causes its victims to oscillate in and out of existence. A further threat presents too, that of new-fangled moving pictures, courtesy of an American showman Robert W Paul (Nigel Whitney), whose “Theatrograph” appears to be the sum of all Jago’s fears! Morris goes solo for ‘School of Blood’, sending Litefoot undercover to a girl’s school for a tightly plotted comic adventure. Employed by the near hysterical Headmistress Miss Broodie (really), the resourceful Professor has to handle not only the spirited Sixth Form and a lurking vampire, but Jago posing as the caretaker too. Thankfully, he had done his homework! Justin Richards returns for the emotional finale ‘Warm Blood’, with Ellie drawing our heroes below ground to encounter the vampiric bid bad, the Old One – played in bloodcurdling style by Ronald Pickup. The adventure resolves in an elegant, if direct fashion, but the meat of it is ultimately the resolution of Ellie’s tale, which throws a tragic connection right back to Season 1 and her brother’s death. While it was satisfying to make that link and have the truth finally aired between the friends, and we are reminded that the Master explicitly sent Ellie in the direction of the Scarlet Gallery, quite who painted “Death on the Platform” seems to have remained a mystery. Perhaps it was a backup for the Master’s plan or simply just a way to wreak further havoc after he had made off with the Doctor’s life energy? As well as Ronald Pickup, notable guests across the set include Ronan Vibert, whose resonant voice is impressively intimidating as the vampire Ravener, Charlie Hayes as one of Litefoot’s students and Jacqueline King in dual roles as Old Ma Hambley and Miss Broodie. 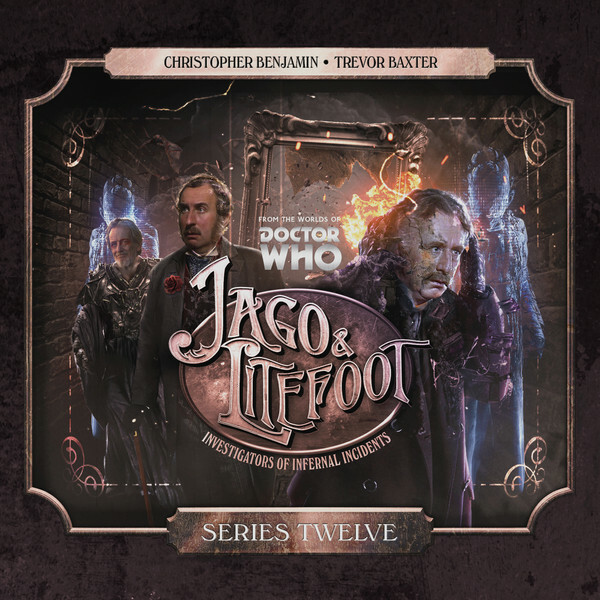 Twelve volumes in, these intrepid investigators show no signs of slowing down, with Benjamin and Baxter still inhabiting their roles superbly, ably assisted by Bowerman and Asquith. However, with two seasons featuring one of the regulars turned to the bad, as Quick spent the last under the ‘fluence of The Master, we look forward to fresh adventures with the friends all pulling in the same direction. Thankfully, Season 13 has already been announced! Released in October 2016 by Big Finish Productions Ltd. While it was satisfying to make that link and have the truth finally aired between the friends, if we are honest, quite what drew her to the Scarlet Gallery in order to find it was lost on us. You’re right, I had remembered the Master tinkering with her metabolism but not the direction to the gallery – thanks for picking that up. I’ll ask to have the review changed. I would still query who painted the picture though, unless it was a backup for the Master’s plan? Or a way to wreak havoc after he had made off with the Doctor’s life energy?